TK O'Brien's Guide to Playing the Mountain Dulcimer in Ionain mode (DAA) Standard notation & Tablature. TK O'Brien's Guide to Playing the Mountain Dulcimer in Myxolydian mode (DAD) Standard notation & Tablature. DU-CP Available in a variety of woods. Fits up to 1 3/4 inch fretboard. 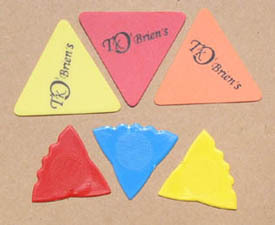 N-PD TK O'Brien's Picks available in thin (red), thin-medium (orange), or medium (yellow). N-PH Large teardrop Herdim picks available in yellow. 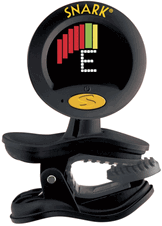 ET-P Universal pickup with clip-on mic. 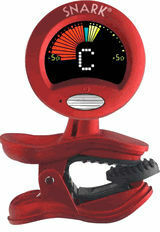 ET-A This mini amp can be used on most instruments. 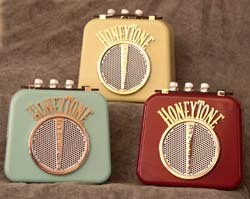 We've found this Honeytone to be an affordable answer for sound amplification. It's very small, about 5 inches square, but has more amplification than other mini amps. There is a belt clip to make it easy to carry. 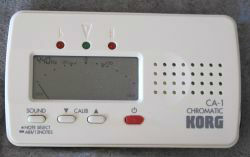 It uses one 9V battery (included). You can vary the sound with volume, tone and gain knobs. The owner's manual shows how to use these settings. 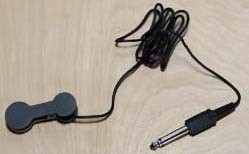 The IN jack allows you to connect your instrument with an instrument cable which can be costly but we've found that an inexpensive electronic tuner pick-up works well. 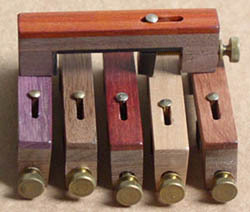 For lap harps and other instruments with zither tuning pins the alligator clip pick-up is preferable because you can clamp in onto the zither pin. The pick-up (ET-P1) is sold separately. Yellow, aqua, or burgundy, or black.